Starting this August, Indian Army fighting units on the Line of Control and in the Kashmir Valley get to add a most rudimentary piece of equipment to their arsenal, one that won’t just offer them better protection, but free them up significantly for more potent combat. Because let’s face it, for all the consternation over stalled modernization of Indian Army’s weapons regiments, it’s easy to miss the comparable — or worse — delays in addressing that most basic of needs: personal combat protection for infantry soldiers. Thankfully, as you probably know, there’s been some belated movement on that front this past year. And as tensions escalate along the Line of Control in Jammu & Kashmir, the churn at little facility in northern India couldn’t be more welcome. Straight up, in less than two months, the Army gets to start replacing its patkas and standard issue Model 1974 infantry combat helmets, both deemed inadequate for the surge in scale and breadth of operations Indian soldiers have had thrust on them. The new combat helmets that the Army will begin taking deliveries of in August will be its first in a quarter century. 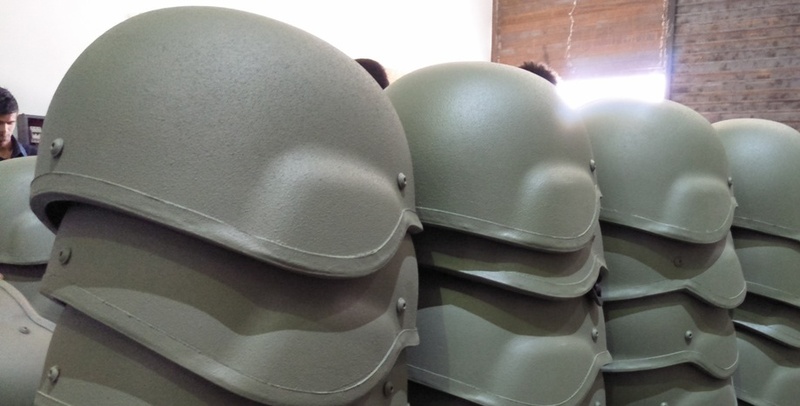 The first lot of the 1,58,000 ballistic helmets built outside Kanpur by Indian firm MKU will be shipped to infantry and counter-insurgency units, expectedly starting with battalions based in Jammu & Kashmir. Livefist had the opportunity to visit MKU’s production facilities last month to inspect the high tempo run that’s been supplying to foreign militaries, paramilitaries and police services for years. And now speeding up to meet the Indian Army’s delivery schedules — its first such order from the Indian armed forces. MKU’s Mukut ballistic helmets are manufactured at an integrated MKU facility at Malwan in Uttar Pradesh’s Fatehpur district, about 40 minutes from the industrial hub of Kanpur. Starting with bales of KEVLAR that MKU sources from three international suppliers, to final integration with communication sets (50,000 of the 1,58,000 helmets will be commander configuration with in-built COMMS kits), the Malwan unit is currently building customized versions of the Mukut helmet on its primary production line, with ongoing production continuing for foreign customers, including Chile, Spain and Malaysia. The helmets are a bolted variant of MKU’s flagship Mukut ballistic combat helmet. The latter, MKU says, are more expensive but significantly stronger, with uniform ballistic protection that ‘minimizes lethal injuries due to helmet shell compromise’. As part of their proving phase, the new helmet design has been tested at HP White Labs in the U.S. and MKU’s own ballistics testing facility in Germany. Apart from ballistic protection from rounds, MKU says the Mukut helmet being supplied to the Army also sports a Behind Armour Blunt Trauma (BABT) of less than 10mm, ‘nearly 40% lower in comparison’ to the Model 1974 currently in service, and a compelling factor for the headgear upgrade. The strengths (and weaknesses) of the new helmets are necessarily classified, though Livefist can confirm that the Army has opted for the new kit based on a variety of factors: principally strength, but also coverage (head top, sides and back), robust fit with memory foam padding that rules out the need for constant adjustments (dangerous in an active combat scenario) and the ability to take on accessories. While the Indian Army hasn’t opted for MKU’s Multiple Accessory Connector System (a proprietary integrated, all-in-one mounting system for NVD, torches, cameras, masks and communication headsets), it has the option to procure them as an add-on. MKU, incidentally, is also in the race for a large Indian Army night vision device (NVD) order, for over 44,000 devices, and has plans to diversify into electro-opticals for air land land platforms, thermal imagers, weapon sights, medium caliber ammunition and even assault/sniper rifles. The 1,58,000 helmets ordered by the Indian Army are only a fraction of what the the force will finally need across its units. MKU managing director Neeraj Gupta hopes to more than quadruple the company’s order for the 700,000 helmets he says the Army will finally require. Overall, the company sees business for more than a million helmets across the variants it builds them in — for police, paratroopers, tank crews, airborne troops and special forces. MKU currently also competes with Tata Advanced Systems Ltd (TASL) for the Indian Army’s biggest buy of bulletproof jackets in decades — for 1.86 lakh units. Look out for Livefist’s post on that contest shortly. Sir please bring some news about the current status of indigenous small arms being developed by DRDO/OFB like AAR,JVPC,TAR, INSAS MK3 etc. Finally decisions taken by this Government are yielding results. That too under make in india program. This also gives credibility boost to our indian suppliers, since our own armed forces use the indian gears ! I hope MoD works with mku/tata to develop next gen personal protection gear for the indian armed forces. I do hope these are far better than the current Patakas in providing pritevtion against ak-47 rounds. Patakas are built to withstand 7,62 rounds! Even ParaSF are seen with Patakas, even though they have access to imported helmets. It serves a specific purpose and it is good at. Is it really bullet proof even American helmets are not bullet proof. Lets hope the best ‘make in India’. But i dont think that it will be at the level of foreign forces helmet’s..we spent lots of fund for equipments and weapons but we used to get only the 3rd class one..thats make all indians morale down…frankly said i am not happy and am not eager to wait this thing coz it will comes out with ‘sabse ghatya wala’ type helmet after spending crores of money….but lets wait and see am wring or not.. The manufacturing process does not inspire confidence …. It looks to be a small SME operation, rather than a professional life saving defence equipment supplier…. These helmet need to be covered with camouflage cloth of Indian army combat uniform just like US or other foreign armies does. These helmet appear totally different because of their green painted color which does not match camouflage color of Indian army and would be easily visible in field thus jeopardizing soldiers location. Finally. BTW do these stop AKs? It’s been interesting to read some of the comments here about ‘stopping’ AK rounds. Everyone needs to remember that when these units undergo ballistic testing, rounds are fired from different ranges to study the impact & penetration patterns. I doubt there are any helmets out there that can withstand the impact of a 7.62×39 round fired point blank at it and be lightweight enough for constant use without the soldier getting a headache. But, the Kevlar may be able to deflect the same round fired from say 150-200m away due to the natural loss in kinetic energy of the bullet by the time of impact. for your information, these Helmets are produced from Twaron fabric not from Kevlar. 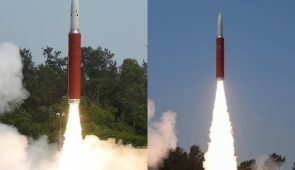 Twaron performs better than kevlar and meets the indian demand for BFS <13 mm.